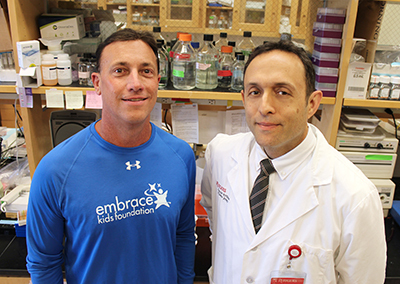 New Brunswick, N.J. – Rutgers Cancer Institute of New Jersey now has additional resources in the fight against pediatric cancers and blood disorders, thanks to a $1 million commitment from Embrace Kids Foundation that will support the recruitment of pediatric cancer research faculty. According to the American Cancer Society, the childhood cancer death rate declined by more than two-thirds from 1969 to 2015 largely due to improvements in treatment and high rates of participation in clinical trials. “While this statistic is positive news, there is so much more that needs to be understood about the biology of pediatric cancers so that new and innovative therapies can be identified,” notes Rutgers Cancer Institute Chief of Pediatric Hematology/Oncology, Peter D. Cole, MD. “As New Jersey Jersey’s only National Cancer Institute-designated Comprehensive Cancer Center, Rutgers Cancer Institute is responsible for conducting in-depth research and translating that science into cutting-edge treatments. Now with this generous support from Embrace Kids Foundation, we have an opportunity to recruit talented investigators who will help us accomplish these aims so that we can provide more patients with improved outcomes. We are extremely grateful to the Foundation for sharing in our mission,” adds Dr. Cole, who is also a professor of pediatrics at Rutgers Robert Wood Johnson Medical School. Cole also was recently named the Embrace Kids Foundation Endowed Chair in Pediatric Hematology/Oncology thanks to a previous $1.5 million gift from the Foundation. In this role, he will lead precision medicine and immunotherapy exploration as well as other advanced research as part of the Pediatric Hematology/Oncology Program. Cole is well versed in clinical research, having developed pediatric cancer clinical trial protocols in conjunction with the national cooperative organization Children’s Oncology Group and other collaborators. 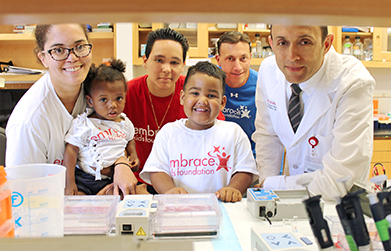 “Since 1991, Embrace Kids has provided major gifts totaling a combined $7 million to Rutgers Biomedical Health Sciences and RWJBarnabas Health with a significant portion of those funds directed to supporting the leading pediatric hematology/oncology program at Rutgers Cancer Institute. That level and duration of giving is the highest endorsement possible and has acted as a catalyst for growth and innovation. This latest commitment of $1 million will take us to nearly 30 consecutive years of major gifts. That is something to be proud of!” notes Embrace Kids Foundation Executive Director Glenn Jenkins.